Blockbuster is bringing it’s On Demand service to the living room. That shouldn’t be a surprise since the company has nothing going for it right now. I’m not sure there is a Blockbuster left in my area. Netflix wiped them out with DVD rentals and proactively went to DVD streaming which sealed the deal for Blockbusters death. Blockbusters last year launched On Demand which has a decent lineup of content and their software is getting better from what I hear to try and compete. 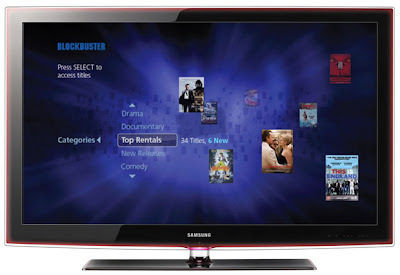 They are partnering with Samsung to bring On Demand to HDTVs, Blu-ray players and home theater setups. This is a similar scenario to what Netfix started many years ago. While I use Netflix and have 2 Roku players I think this is a good thing. Competition will make both companies better and might prevent Netflix from doing a tiered pricing for streaming or drop the surcharge for Blu-rays. Anyone use Blockbuster On Demand? What do you think of the service?